The MSE program’s major emphasis is on the further development of engineering knowledge and skills in an effort to enhance the productivity of the practicing engineer. The program provides a flexible platform for students to take either an integrated approach or a specialized approach to meet the demands of their career. The MSE program enables graduate engineering professionals to further their problem solving skills through the application of advanced engineering principles and methods. The strength of this program is in its flexibility. The program offers students the opportunity to advance their quantitative skills through a series of modeling-based courses and provides for their choice of specialty courses in electrical engineering or mechanical engineering and/or other related fields. The program allows for breadth and depth of engineering topics and culminates in either a project or final paper where the student must integrate the knowledge and skills learned in the program. The MSE is aimed toward engineers who are involved with industrial projects.The program’s major emphasis is on the further development of engineering knowledge and skills in an effort to enhance the productivity of the practicing engineer. It provides a flexible platform for students to take either an integrated approach or a specialized approach to meet the demands of their engineering practice. All classes are offered in the evening, providing convenient scheduling. The program is designed for individuals who hold bachelor degrees in engineering, engineering technology or other closely related areas. Each student works with the program director to plan a course of study tailored to his or her needs. Typically, a total of 45 graduate credits is required to complete the program, but degree requirements may vary depending upon the type of bachelor’s degree. Read more about MSOE's M.S. in Engineering graduate degree. 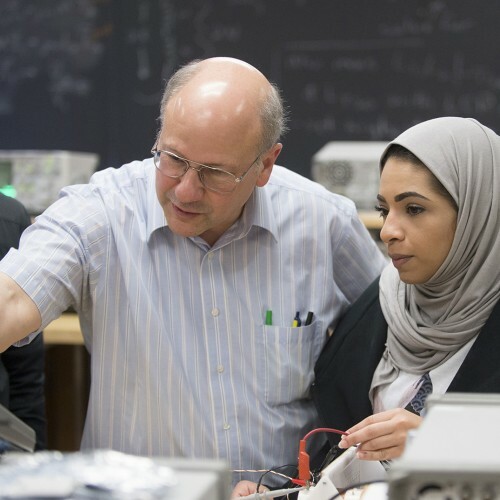 Get to know our distinguished engineering faculty!